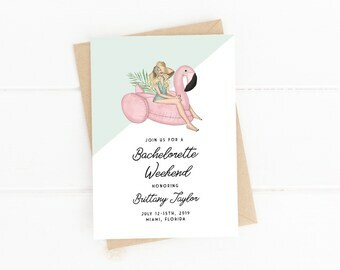 Custom, unique invitations for weddings, birthdays & more! IMPORTANT: Please read the ITEM DETAILS portion of the listing IN FULL prior to placing your order. We are more than happy to answer any questions if something is unclear. NOTE: If you purchase a digital file, please note THIS IS NOT AN INSTANT DOWNLOAD. A digital proof will be sent to you via Etsy message within 3 business days. So willing to work with me and instructions were super helpful when it came time to decide how to print! Also responded in a timely fashion! Britni was incredible to work with. We ordered her digital printable PDF and printed them out at Staples. The end result was beautiful, colorful, and exactly what we wanted. 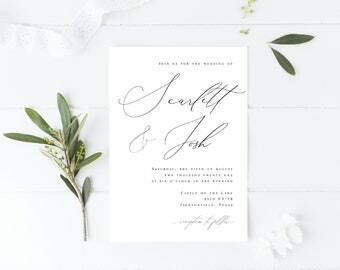 She was flexible about changes we had to make - like font size and creating a new RSVP when we were concerned our first wedding website choice wouldn't work. All in all, she was prompt, helpful, and great to work with. The invitations are incredibly beautiful. :) Everyone loves them, and they fit my wildflower wedding theme wonderfully. Hello & Welcome! Please make sure to read the Item Details of each listing carefully prior to purchasing. All proofs for digital and print orders are sent within 3 business days. This DOES NOT include Saturdays or Sundays. ex: If your order is placed on Wednesday your proof will be ready on Monday. We try out best to get your order out as quickly as possible but generally need to utilize all 3 business days due to volume. Thank you for your patience, love and understanding! We're so happy to have you! Due to the customized nature of Paper n' Peonies products, there are no refunds or exchanges. Of course, we'll do everything we can to make sure you are completely satisfied with your purchase before then. Please contact us if you have any problems or concerns! We accept all major credit cards, etsy gift cards and PayPal. Design work and/or printing will not begin until payment is complete. Printed items are sent via USPS Priority Mail within the USA. International shipping is addressed on a case-by-case basis. Please convo/email us for an international shipping quote. The initial proofing process begins within 3 business days, 4-5 business days for custom designs, and will conclude when you are completely satisfied with your design. Once a customer gives their final approval, print and ship time is 3-5 business days. * By submitting a photo to me, you agree that you are the original photographer or have written permission from the copyright holder. You also agree to take full responsibility for any misuse of copyrighted images submitted through this website. If you are printing yourself, I suggest having a sample card printed BEFORE you print all of them. That way, if the colors don't turn out the way you were hoping and can adjust them for you at no additional cost. Colors vary based on your computer monitor so printing a sample is strongly encouraged. I sometimes display customer cards and designs on my Facebook page. I always change the address and phone number, but if you prefer not to have yours displayed, please let me know at the time of purchase. I will always respond to messages and emails as fast as I can, and I do my very best to have a proof to you within 3 business days. If you haven't received a proof within 3 business days, please send me a message or email to make sure your order wasn't lost! Once a customer has approved the final proof, Paper n' Peonies is not responsible for errors or typos. Please read your proofs carefully! It's often helpful to have a third party review the proof for typos & mistakes. All graphics and images are © Paper n' Peonies and intended for personal use only. All rights reserved.